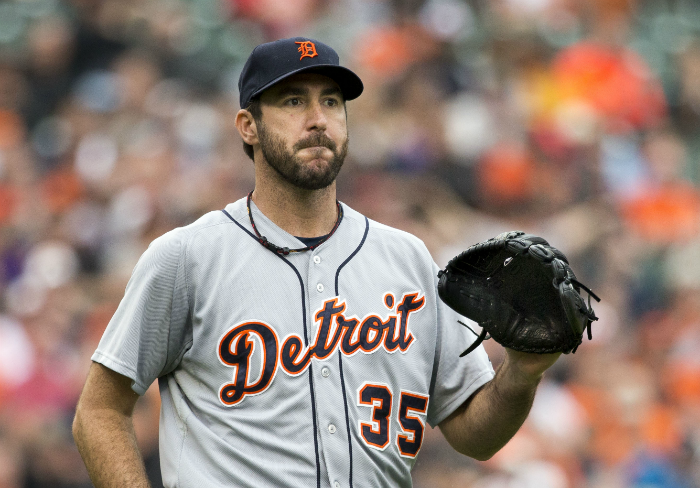 The Detroit Tigers will start the season without Justin Verlander as he battles a triceps injury. He is scheduled to pitch on April 12th, the Tigers 6th game of the MLB season so there is no need for any real concern, yet. Verlander has pitched 16 innings during Spring Training, allowing 6 home runs and has a 5.63 ERA. This has been a trend for Verlander, who has seen his regular season ERA climb from 2.40 in 2011 all the way up to 4.54 in 2014. He dates Kate Upton, so he has that going for him! Verlander was coming off fantasy baseball draft boards as the 35th starting pitcher, in the 11th round of 12 team leagues. NFBC leagues were waiting until the end of the 15th round to draft him, making him the 47th starter drafted. It is clear that Verlander is no longer the pitcher we all fell in love with, pitching 251 innings in 2011, striking out 250 batters, but the Tigers need him in their rotation that no longer features Max Scherzer or Drew Smyly and added Alfredo Simon and Shane Greene this offseason. Verlander is owed $28 mil/year through 2019 and Anibal Sanchez will earn $16 mil for 3 more seasons. David Price is entering a contract year and if they can not re-sign the lefty, the Tigers will have to go hard after free agent pitchers. But if they were willing to let Scherzer play out his contract and let him walk, there is no reason to believe they will re-sign Price or even trade him, should they be in the playoff hunt come the MLB trade deadline.